Due to a consistent increase in workload, 105 West are seeking an experienced technician or Architect to join our team. We are looking for a person experienced in the use of AutoCad, SketchUp and Photoshop, preferably also with experience of NBS Building specification software. The successful candidate will be working on a variety of projects, covering all stages from feasibility to completion. If you are interested, please contact us either via the website or give us a call. Welcome to the new 105 West website. Details of numerous exciting projects, from bars to individual houses, which we have been working on since the last blog post will be appearing very soon. 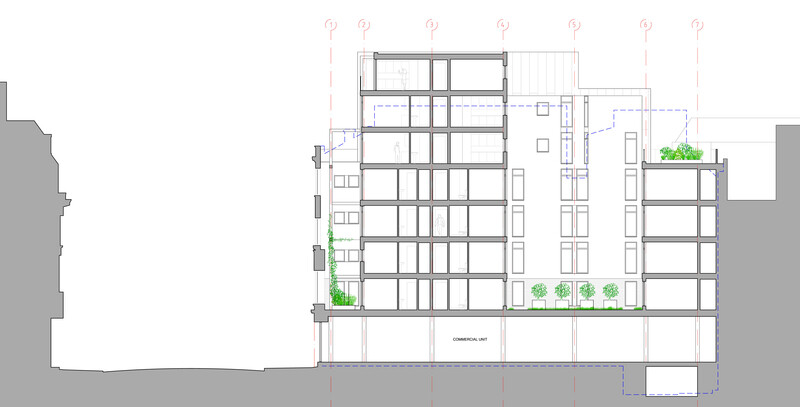 Toward the end of 2014, 105 West suceeded in gaining planning permission for a modest but complex residential scheme. Due to the unique nature of the scheme, gaining permission merited the front page of the Bristol Evening Post newspaper (see the link below). 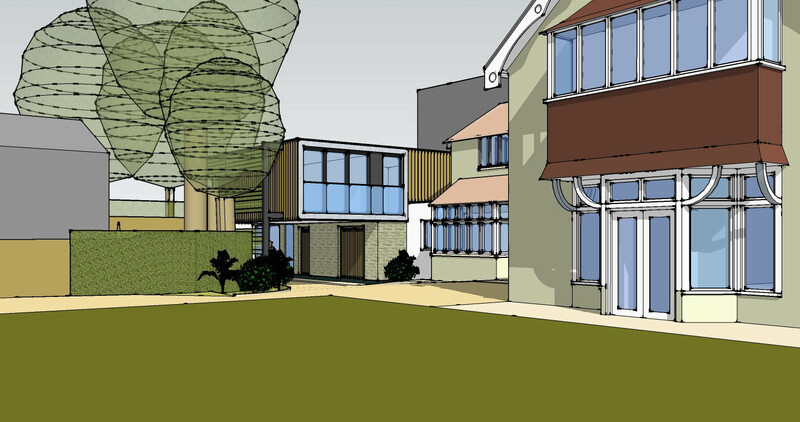 Following extensive negotiations with the local planning authority, permission was granted by the planning committee for two residential homes on a challenging urban brownfield site in the Clifton area of Bristol. 105 West worked in together with Aspect360 planning consultants (www.aspect360.co.uk) to achieve permission. The spring and early summer of 2014 sees several projects under construction in the Bristol area including student accommodation, commercial nursery, new houses and residential conversions. A number of mixed use projects, combining residential and commercial elements, are in the design or planning stage. The recovery of the construction industry is continuing and has resulted in an increase in workload over the last few months, so the spring also brought a new member of the team at 105 West Architects. After gaining planning permission at a successful planning appeal in 2012, work started on site at the end of 2013 on construction of a development of 12 student flats and a commercial office space. The development, which is close to the Bristol University campus, is due to be completed in time for the start of the 2014/15 academic year. The project was put out to tender to a number of local construction companies. Construction is concrete block with concrete separating floors, providing a structure with longevity, good acoustic separation between bedrooms and good thermal mass for internal temperature stability. The completed building will provide student accommodation for over 50 students and commercial office space, which is due to be occupied by the owner of the building. A planning application for a terrace of nine modern family houses with a nursery and a commercial space has been submitted. The site is in south Bristol, fronting an open, pleasant public space. The five bedroom houses with integral garage spaces will provide much needed family housing in the area. Work is almost complete on the conversion of a former healthcare building to provide a commercial childrens nursery near the Downs in Bristol. Despite there being no change of use in planning terms, the building required substantial adaptation and refurbishment. This is the latest in a number of projects for the same client. Works on site are complete on the conversion of a Victorian former school house to form two flats. The resulting flats are very close to Bristol airport and ideally suited for airport workers, allowing them to walk to work. The building required substantial refurbishment and alteration to provide modern, energy efficient and comfortable accommodation. 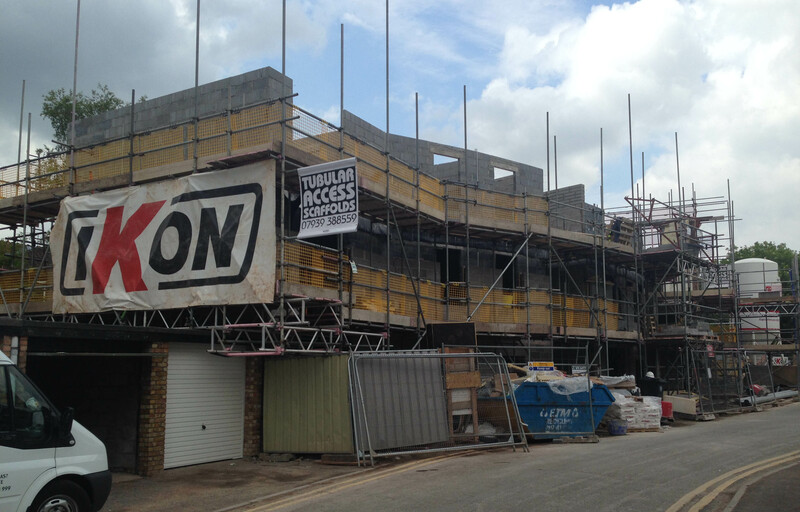 Construction of a new house in a very prominent site near Bristol Zoo is advancing rapidly. The three bedroom property is a contemporary house, but very much in keeping with the aesthetic of the historic conservation area. Images of the construction will be added in late June. As well as the above, a number of projects are also currently under construction for which 105 West provided services through the planning and building regulations stages. The clients for these projects comprise property developers, self build and a construction company. The latter stages of these projects are being dealt with by the clients themselves, although 105 West are always available to give advice when required. Over the course of the summer, 105 West have become increasingly busy. The widely reported signs of an upswing in the construction sector have been manifested as an increase in enquiries and potential projects. These new projects and enquiries have been largely residential developments, combined with some mixed use schemes. At the same time as dealing with the new projects, 105 West are also in the process of proceeding with a number of on going projects, ensuring that buildings are completed. Current projects range from student accommodation to a commercial nursery to private residential projects and open market housing. As ever, our work is mainly within the Bristol City limits, but with a few projects outside Bristol. 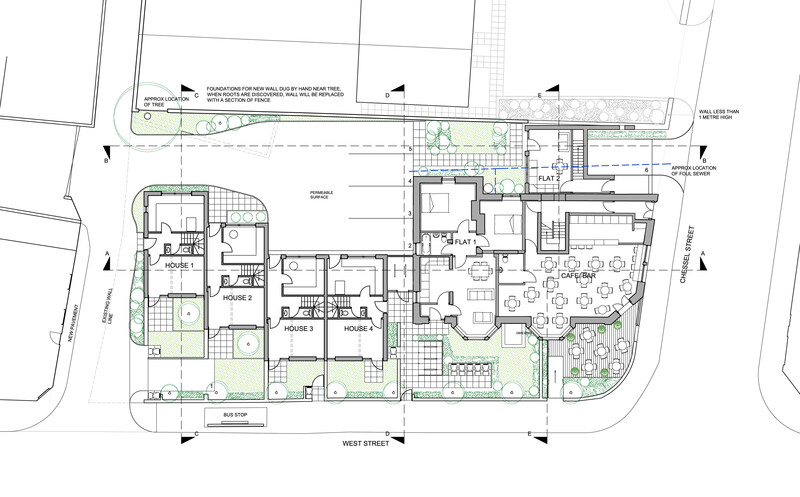 Having gained permission at a planning appeal earlier in the year, this scheme for 51 student beds in 12 units of varying sizes plus a commercial office unit, has now been put out to tender. The aim is to commence construction in autumn 2013 with works being completed in time for occupation in the academic year 2014/15. Strip out of the existing building, followed by a contract for the required demolitions is due to be swiftly followed by a main contract for the construction works. A former NHS healthcare building is in the process of being converted in to a commercial nursery. This is the second project of its type to be carried out for the same client following the success of the previous project. As the new use of the building falls into the same planning class as the previous use, only minor alterations required planning permission. This has allowed the project to proceed swiftly, with work now being carried out on site. planning and building regulations stages. With our works complete, the construction company is now progressing with the build. The conversion of a former chauffeurs accommodation in a prominent position in Bristol was granted planning permission early in 2013. Due to the high profile location and the current condition of the building, the process of moving toward construction has been complex. However, tenders for the construction work have been issued and it is anticipated that work on site will commence in the autumn of 2013. The new building will provide a three bedroom home with integral garage and garden. 105 West will be acting as contract administrators for the project, seeing the process through from initial sketch proposals to completion of the construction works on site. 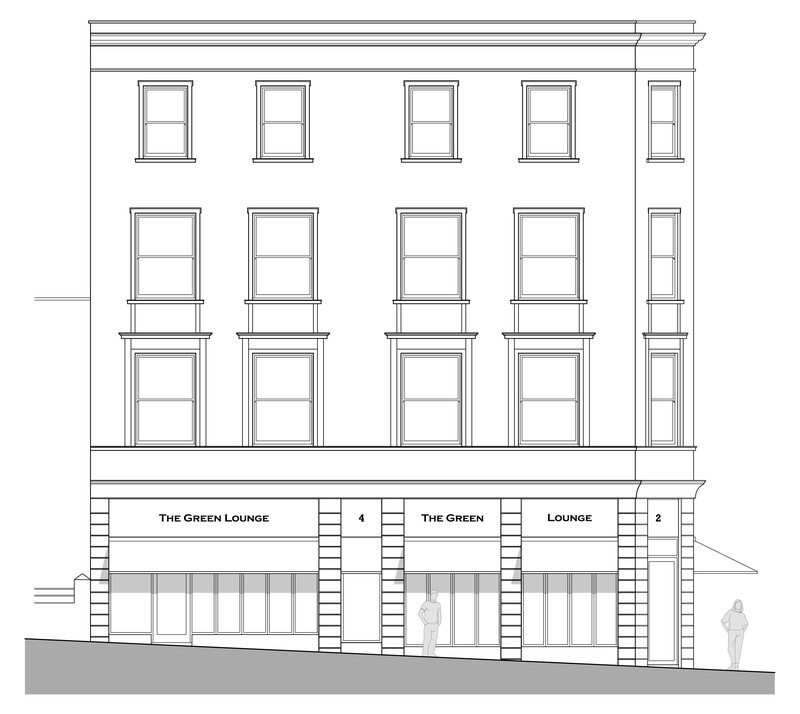 Planning permission and building regulations approval have been gained for alterations and refurbishment of and existing retail unit in Clifton, Bristol, with accommodation above. In addition to works to the existing property, a two storey extension is included to the rear of the building, increasing the accommodation within the property. With the building being in a densely developed area, party wall agreements are currently being secured with all of the close neighbours, prior to commencing work on site. The conversion of a former coach house to provide a two bedroomed unit for an elderly relative and carer were completed early in 2013, with the owners and the elderly relative being very pleased with both the quality and the cost of the construction works. A substantial alteration to a property in the Westbury-On-Trym is nearing completion, with the owners taking occupation of the property during the summer. 105 West were responsible for the planning and building regulations stages of the project. The client having previously been involved in on site construction for a number of years took on the project from that point. The result is a large and spacious family home with close relationships to both the front and rear gardens. A two storey extension to a property in south Bristol is currently under construction on site. This extension substantially alters the character the home, again, providing more open plan living with a close relationship to the garden. The new first floor bedroom replaces a small 'box room' with a large bedroom with full height glazing facing the garden and a spacious en-suite shower room. The conversion of a number of former agricultural buildings in an idyllic rural location to the south of Bristol, with a link attachment to an existing family home, will approximately double the accommodation space for a young family. This project has gained planning permission and with shortly be moving into the building regulations stage. 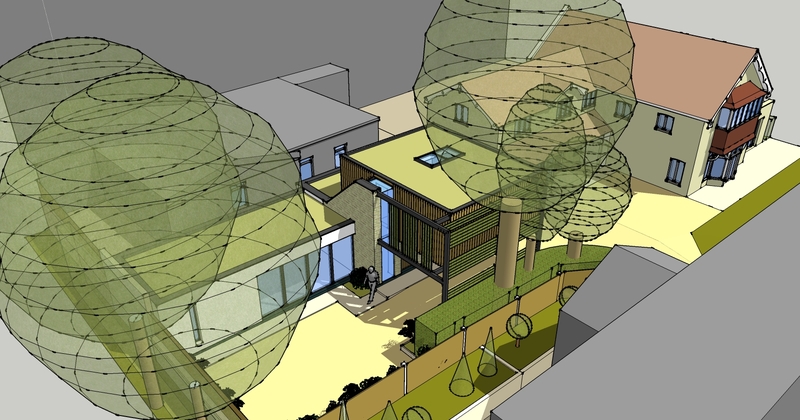 Tenders will soon be sought for the extension of a house in central Bristol. The works include a single storey extension to the rear of the property and the addition of an en-suite shower room and large dormer window to an existing loft conversion. With confidence increasing in the property markets and the construction industry, the workload of 105 West Architects has been steadily increasing over the end of 2012 and early 2013. A number of new projects have begun, existing projects have moved forward and projects have completed. We are currently working on feasibility, planning, building regulations and construction design for a number of projects. Having gained planning permission for a development of 51 student rooms in 13 'cluster flats', the project is now moving on to the building regulations stage. The existing building on the site has been cleared, site investigations have been carried out and a structural assessment of the existing building have been carried out. Detailed design for the construction of the new build element of the scheme is also proceeding. The building regulations stage of the project is underway, with the detailed construction design being carried out concurrently, allowing the project to move forward rapidly. 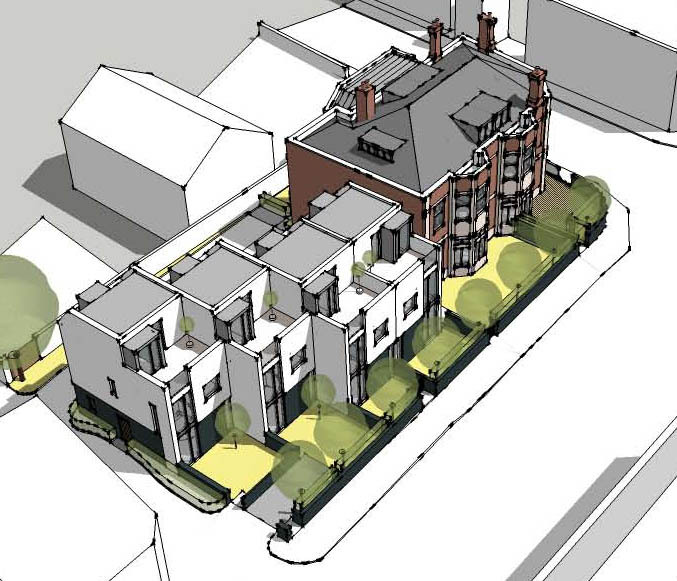 The scheme comprises four new build contemporary houses and the conversion of a former public house to provide a cafe/bar and six flats. 105 West Architects have been appointed for the conversion of a former healthcare building to create a commercial children's nursery for an established local business. This project will be the second of it's kind for the same client. The first project converted a former commercial office building to a nursery, which also required a change of planning use class. 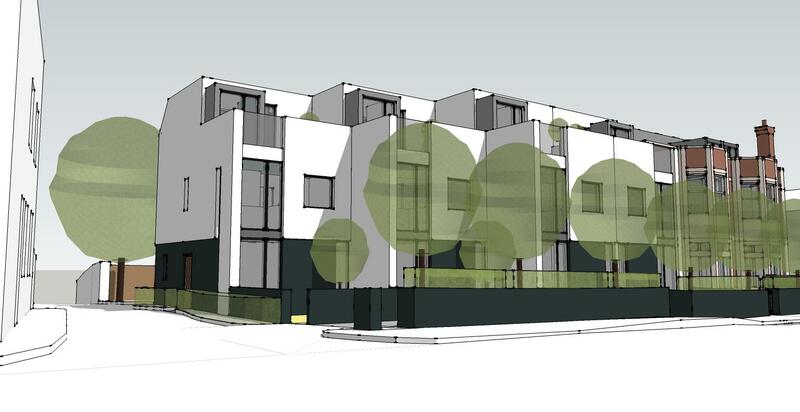 This second project requires no change of use and therefore planning requirements are predicted to be limited. 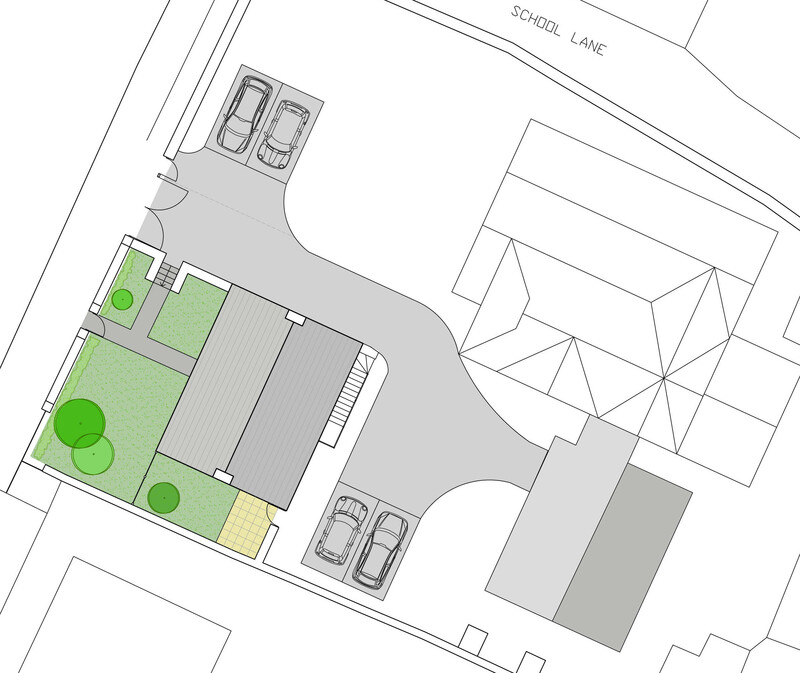 Having gained planning permission for the conversion of a former chauffeurs quarters and garage to a substantial residential property, 105 West are now in the process of discharging a number of complex planning conditions relating to the project. As a historic building in an advanced state of disrepair with associated structural problems, stabilisation of the existing building and an archaeological assessment are required. A building regulations application has been submitted for the conversion of a former school house to form two flats. Planning permission for this project was gained in late 2011, but the project was put on hold until February 2013. The clients are now keen to push the project forward swiftly. 105 West have completed the conversion of a former garage and storage building to create a detached two bedroom annexe to a large house in the Redland area of Bristol. The annexe provides accommodation for an elderly relative on the ground floor, with accommodation for a carer at first floor level. Planning applications have been submitted for a number of residential alterations and extensions. Further details of these projects will be available as the projects progress. Works to a set of industrial units in Keynsham to create office space and a customer reception have been completed. 105 West were responsible for the planning and building regulations stages of the project, with the client and contractor completing the works on site. Pre-application submissions have been made for residential conversions and extensions within Bristol. These projects are on going. 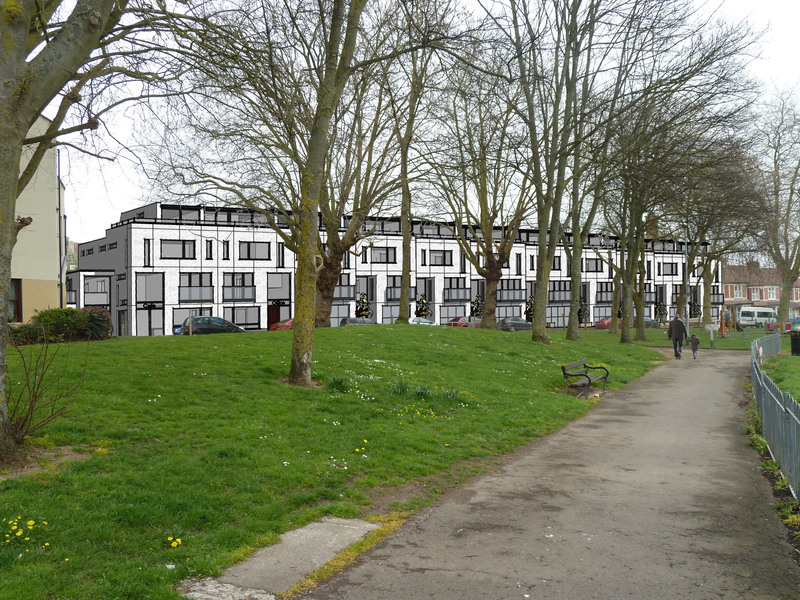 Working in conjunction with a local planning consultant, a student accommodation scheme in the Kingsdown area has been granted permission at appeal. Despite a protracted pre-application planning process, Bristol City Council had refused the scheme based on the potential for an exacerbation of a perceived imbalance in the housing stock in the local area. The concerns of the local authority were that there would be an imbalance between open market housing and student accommodation, which would be deemed to have a detrimental effect on local shops and commerce as well as exacerbating issues of noise, disturbance and anti social behaviour. However, the planning inspectorate found in favour of the proposed development, which is for bespoke accommodation designed specifically for the needs of the student accommodation market. The development will utilise the structure of a former public house, with a largely three storey new build section to the rear. As such, the development will not remove any of the existing local open market housing stock. The appeal decision provides a detailed breakdown of the issues involved and the full appeal decision may be found via the planning section of the Bristol City Council website. Despite the currently challenging conditions within the UK construction industry, 105 West have remained busy throughout 2012. It is too early to know whether proposed changes to the current planning legislation will have an impact on our workload. However, the current workload remains strong and varied. 105 West Architects submitted a planning application for a student accommodation scheme in central Bristol. Working in conjunction with a Bristol planning consultant and Bristol City Council, the scheme is currently undergoing revisions. The proposed accommodation is located within the envelope of an existing, unused building and comprises of a mix of cluster units (flats) and single occupancy studio units. At ground floor level the scheme also includes a retail unit fronting onto a busy shopping street. The scheme is designed to preserve and enhance the recognised significance of the existing street scene, while providing a modern retail unit with contemporary accommodation behind the existing facade. Planning permission has been gained for the re-development of a former public house in south Bristol, with four new build houses adjacent. The client for this project is a construction contractor and developer. It is anticipated that this development will progress through to completion. 105 West gained planning permission and building regulations approval for a new restaurant which has recently opened in the prominent retail area of Park Street in Bristol. Photographs of this premises are to be posted in the near future. 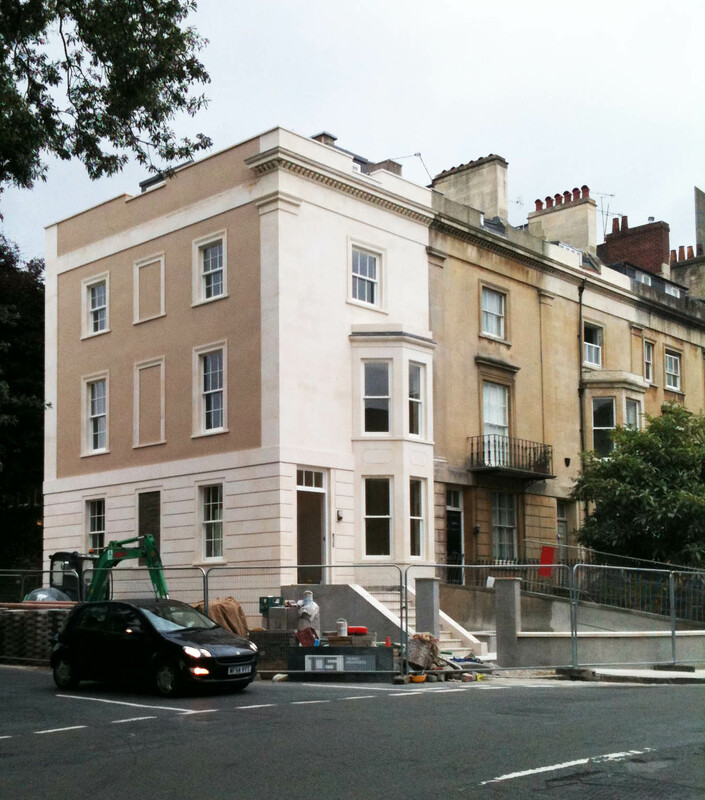 Works were recently completed on a large period property in the Clifton area of Bristol. 105 West are continuing their involvement with this property. It is proposed that a currently dilapidated former garage and cottage is to be renovated to provide a three bedroom house with integral garage. 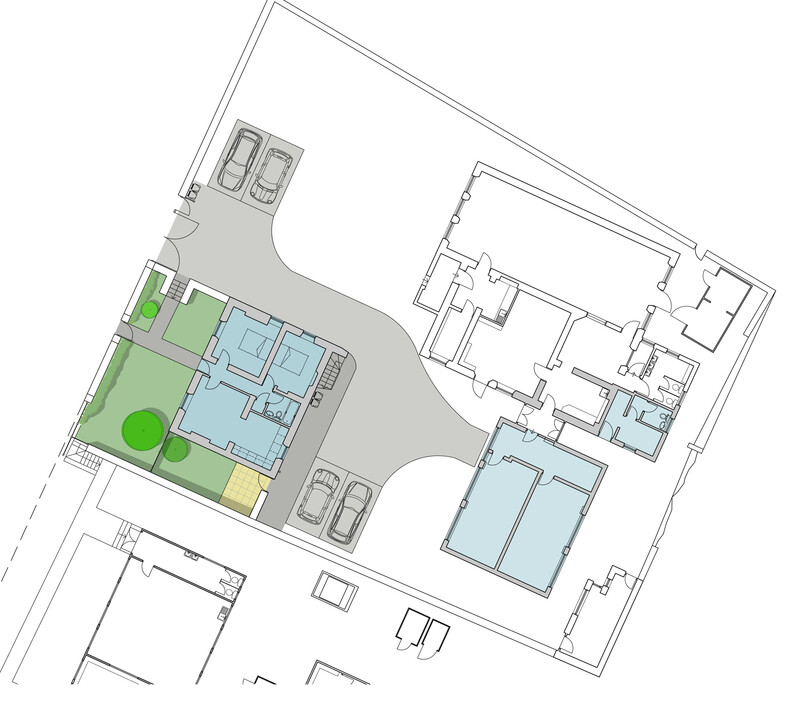 Planning permission has been gained for alterations to an industrial premises in Keynsham, between Bristol and Bath. An established local business providing motor vehicle parts had purchased four industrial units as their new premises. New two storey office space was required within the existing units, as well as a new entrance to reflect the image of the business. This project has now moved onto the building regulations stage, with an approved inspector appointed. A planning appeal informal hearing was recently held with respect to a project for student accommodation close to the Bristol University campus. This project was developed by 105 West in conjunction with a Bristol planning consultancy. Should the appeal be allowed, the project is likely to swiftly progress to the building regulations stage. 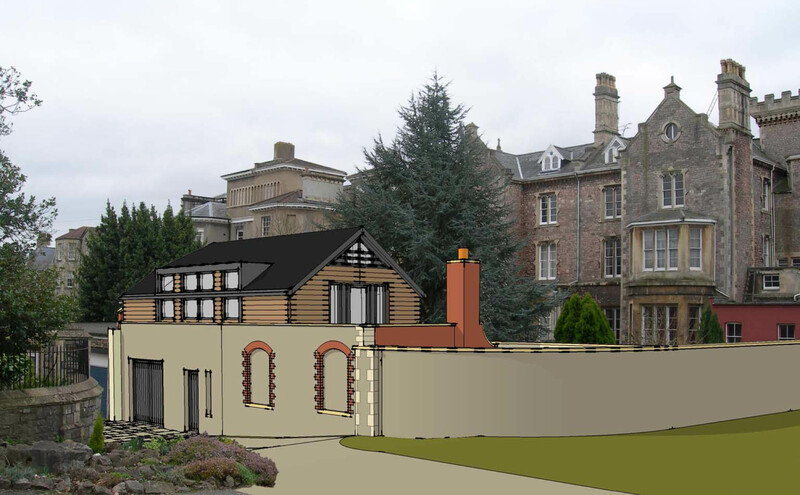 In addition to the above projects, 105 West have gained a number of planning permissions for extensions, alterations and conversions for residential purposes, including an application in central Cambridge. A number of these projects are now proceeding toward construction. Recent changes to the development strategy in Bristol have resulted in increased requirements at the planning stage of most projects. The Climate Change and Sustainability practice note issued by Bristol City Council in July 2011 added significantly to the workload associated with new planning applications, requiring detailed assessments of energy efficiency and the carbon impact of proposed buildings and conversions. Also in July 2011, Bristol City Council issued a Space Standards practice note with the aim of establishing minimum space standards for new residential development. With the feasibility study completed, 105 West have been appointed to develop a planning application for the conversion of an existing large structure in central Bristol to provide residential accommodation. It is still anticpated that the final construction cost will be in the region of £3,000,000. A full planning application is being prepared with the aim of submitting the application before the start of spring 2012. Details of this project will follow as the design is developed. Having gained planning permission for a highly contemporary extension to a property in the Clifton area of Bristol, construction is now well underway on site. The extension which houses guest accommodation and a studio features highly sustainable construction and a biomass heating system. In conjunction with a local planning consultant, a planning permisssion has been granted for the change of use and alterations to a property on Park Street in central Bristol. The property was formerly a professional services office and has been granted permission for conversion to a modern cafe / bar. Planning conditions and the building regulations are currently being addressed with the aim of commencing works on site before the start of spring 2012. A completely separate application for a change of use to a central Bristol retail premises to provide a cafe and retail space is anticipated in the near future for a different client. 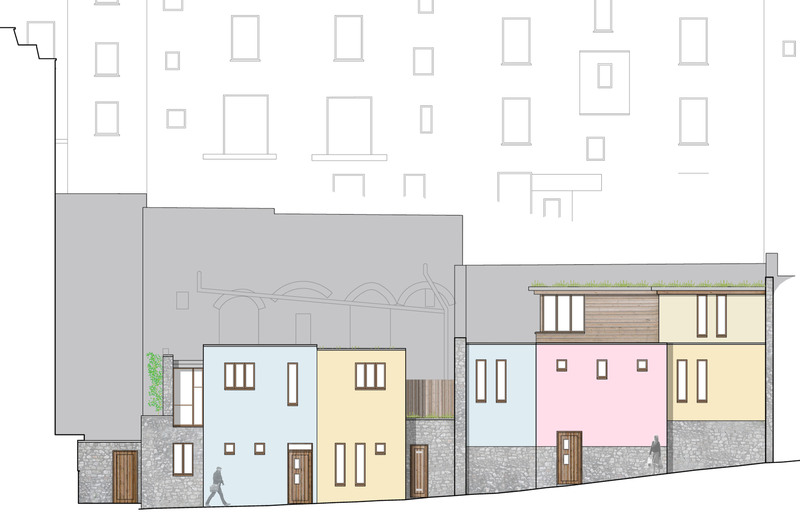 A planning application has been submitted for the conversion of a former licensed premises in south Bristol to flats with a four new build houses on the same site. The site is located on the main route through a popular suburb. The project is being carried out in conjunction with a local planning consultant. Public consultation with local groups resulted in a scheme with wide local acceptance proir to planning submission. Following a lengthy pre-application process, a planning application has been submitted for a residential project near Bristol city centre. The project comprises of works to an existing building to create five floors of residential accommodation plus an office unit. A new build element with a floor area almost twice that of the existing building will be attached to the existing structure, providing a further three full storeys of accommodation with a reduced area fourth floor. Planning permission has been granted for the conversion of part of a former primary school in a village to the south of Bristol. The conversion is to provide two residential units in the former school house with associated work spaces within the school buildings. Tenants are being sought for the remainder of the school buildings, retaining the existing planning use class. Work is very close to completion on the extension, refurbishment and alteration of a substantial rural property located north of Bristol. The project comprises the complete internal and external refurbishment of both the main house and an associated cottage. The fenestration of the main house has been rationalised to introduce a more balanced appearance with improved proportions. A two storey extension has also been added to the property. The energy efficiency of the property has been substantially improved by the installation of insulation to the exterior of the existing building, with a self coloured render finish maintaining the traditional appearance of the property. Photographs of this project are to be added soon. 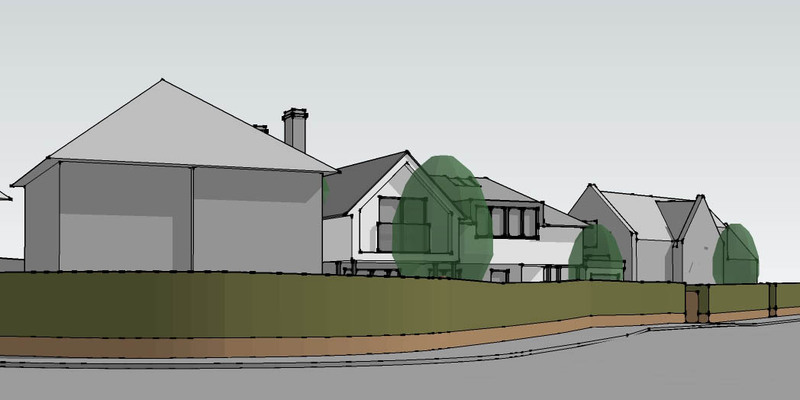 A planning application for three new build houses on a difficult site in the Clifton area of Bristol has been submitted. The topography, plan form and surroundings of the site created a unique challenge, resulting in an equally unique solution. Contemporary in design, the form of the proposed houses is defined by site and the potential effect on the existing housing in the area. 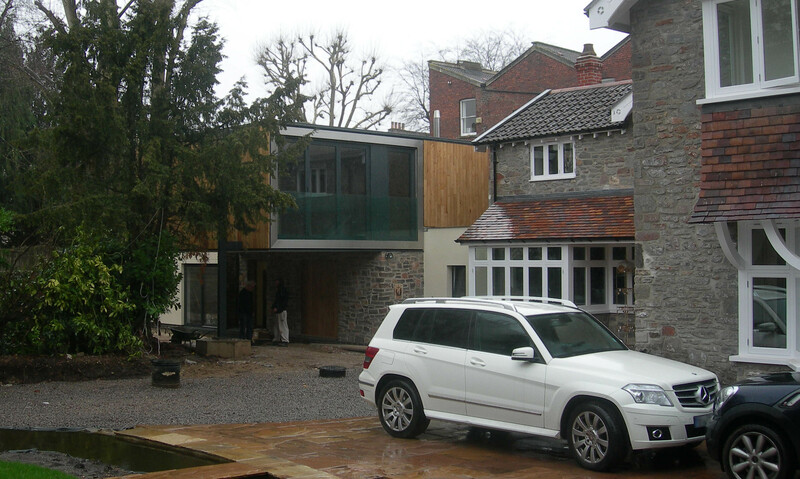 105 West are also working on a number of domestic residential projects in Bristol and North Somerset. Projects include works to listed buildings and an application for lawful development. Through the spring and summer of 2011, 105 West Architects have been extremely busy, with projects on site under construction, projects preparing for construction and planning applications for residential, domestic and commercial projects. Due to the increasing workload, 105 West have recently added another member to our team, allowing workload to be handled in a manageable and sustainable manner. The projects handled by 105 West are becoming more varied as the practice profile is raised. 105 West have recently been appointed to carry out a feasibility study for the conversion of a large structure in central Bristol to provide residential accommodation. This project is in the early stages, with an anticipated approximate final construction cost in the region of £3,000,000. An extensive feasibility study is expected to swiftly lead to the preparation of a scheme suitable for a planning application. Having recently completed the alterations and complete refurbishment of a period house in Bristol, 105 West have also gained planning permission for a contemporary extension to the property. The extension comprises guest facilities as well as a studio space for the owners of the house. Construction has now started on the extension, which features a highly sustainable construction and heating system. Having started construction in 2010, a new five storey townhouse is close to completion in the Clifton area of Bristol. The house completes a grade II listed terrace from which the last house had been lost in the second world war. Visually the new house follows the design of the late Georgian terrace and includes accommodation both at basement level and within the roof structure. The much of the townhouse is clad in Bath Stone, prepared and installed by local Bristol stonemasons. In conjunction with a local planning consultant, a planning application has been submitted for a change of use and alterations to a property in a prime location in central Bristol. The client wishes to open a new lounge style cafe / bar in a former professional services office. A completely separate application for a change of use to a central Bristol retail premises to provide a cafe is anticipated in the near future for a different client. A feasibility study is being completed for the conversion of a former licensed premises to flats with a up to four new build houses on the same site. The site itself is located on a main route through a popular suburb of south Bristol. As soon as the feasibility study is complete, the project will move to the preparation of a planning application. This project is being carried out in conjunction with a local planning consultant. Following a lengthy pre-application process, final scheme design is being carried out for a residential project near Bristol city centre. The project comprises of works to an existing building to create five floors of residential accommodation plus an office unit. 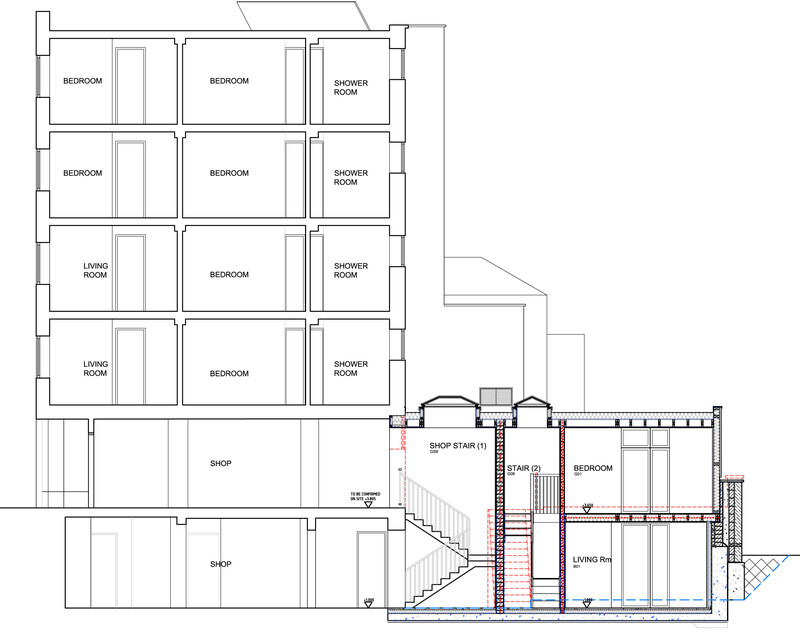 A new build element with a floor area almost twice that of the existing building will be attached to the existing structure, providing a further three full storeys of accommodation with a reduced area fourth floor. The planning application for this project will be submitted in the very near future. A planning application is being submitted for the conversion of part of a former primary school in a village to the south Bristol. The conversion is to provide two residential units in the former school house with associated work spaces within the school buildings. Work is nearing completion on the extension, refurbishment and alteration of a substantial rural property located north of Bristol. The project comprises the complete internal and external refurbishment of both the main house and an associated cottage. The fenestration of the main house has been rationalised to introduce a more balanced appearance with improved proportions. A two storey extension has also been added to the property. The energy efficiency of the property has been substantially improved by the installation of insulation to the exterior of the existing solid masonry walls, with a self coloured render finish maintaining the traditional appearance of the property. A planning application for three new build houses on a difficult site in the Clifton area of Bristol is to be submitted shortly. The topography, plan form and surroundings of the site created a unique challenge, resulting in an equally unique solution. As soon as an on going geotechnical assessment of the site is complete, the planning application is due to be submitted.